MXS Overseas Ltd. EVO1MOJO16 - Dreamgrip evolution mojo modular transformable universal video rig system for any iphone and android OS smartphones, Action Cameras, DSLR Cameras with external Gun Microphone and two 36*LED dimmable 180-lumen lights with USB rechargeable CE/FCC/RoHS certified batteries and more accessories included. The dreamgrip evolution rig system can simultaneously carry several phones and/or cameras together with a plurality of accessories like external lights even more or different from the two included, microphones, and optics like lenses, extra monitors, filters, and DoF adapters to connect DSLR lenses. The pointed gun microphone designed for sound capturing/interviews mainly outdoor to record clear and reach dominated voice over a noise of background environment; The microphone is the best choice for scenes with a human voice to be recorded over plural side sound sources background; Also it comes with track/cold shoe snap mount, foam wind shield, and features 3, 5 Jack audio cable connector; To use mic with an iPhone a standard connector Jack to the lightning port is needed not included. The evolution mojo video rig set includes the most a creator may need for video production - 2 external video lights and the pointed gun microphone; It also features 2 molded anatomical grips and 2 high-grade aluminum tracks to form the rig frame, ND and CPL 52mm filters, 37 and 52mm threaded connectors; The set yet includes 52mm hood, 2 clamp holders and the Optical Module with 17, backlight blinder, and a number of bolts to enable secure and tight connections of modules and other extensions. 2 included powerful 36*led lamps feature the maximum of 180 lumens each the equivalent of the light from 360 candles for two with dimmable light emission power; It is enough to have a clear video of a human face from 3 to 5 meters distance in a completely dark environment; Li-Ion accumulators tha come with Lamps, which are capable to empower them for at least 1 hour with the said maximum light emission and up to 5 hours on the dimmed modes. 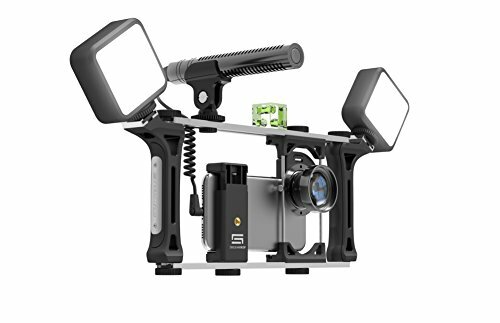 DREAMGRIP Evolution MOJO Universal Transformer Rig for Smartphones, Action Cameras, DSLR Cameras. The Set for Journalists with Wired Gun Microphone and LED Lights. Smart Filming System - Dreamgrip evolution is the most advanced contemporary open eco-system designed for any Creator regardless the level his/her previous experience to assist in mounting and connection of external photo/video/sound accessories and extensions to empower the production of professional quality visual content with just a smartphone. The evolution mojo video rig set has the best unbeatable price/quality ratio if one will compare it with any alternative solutions on the market worldwide. MXS Overseas Ltd. LWT-138ER-41 - It is very lightweight - slightly over 800gr that is about three times heavier than your phone. And yet it is durable and supports gears mounted up to 2, 5kg weight. And the same time it is truly universal to accommodate any DSLR, VCR or action camera with standard ¼" connecting thread. Quick release plate - for swapping cameras on the fly and allows you to pan a full 360° and 90° to get the perfect angle for shooting. As all dremgrip products are, lwt-138 model is universally compatible with any DSLR or compact/action cameras, but first of all meets the major phoneographers requirements. It is made of high grade aluminum to be compact, lightweight, and easy to pack and carry to have it outdoor or to take for a trip. All tripods come with original track nut for the best and secure connection to any of DREAMGRIP Rigs, and original shoulder nylon travel carrying bag. DREAMGRIP Enhanced Lightweight Universal Tripod LWT-138ER-41 - Every box contains: enhanced lightweight tripod, dreamgrip track connector, special travel carrying pouch tripod Specifications: Net weight: 850g / 1, 8lbs; Max. Height: 138cm / 4, 5ft; Max. No other tripod will deliver the stiffness and immovability unless is using with the Connector. Universal - each tripod is the best with dreamgrip rigs. It means a rig with a phone and any extra equipment can be mounted on it all together with a tablet as a monitor or teleprompter. On top of it lwt-138 features quick release plate to mount and dismount your camera of Rig System literally in seconds. MXS Overseas Ltd. DG-VISIO-PRO - Wide angle lens: wide lens brings more objects to the frame be extending the view angle by 40% wider. It will be fixed better, held safely and aligned easily with the Rig Optics Adapter system. With the lens you can show the world as it looks from ant's point of view with all the details hidden from human eyes. Telephoto portrait lens telephoto lens brings objects closer and is the best for taking portrait images with the blurred background behind the face or the object in focus. Smart - enhanced lightweight universal tripod has the smart and original ¼" track connector to tighten the Rig securely and firmly to the Tripod. For instance you can bring an object from the blurred zone at the back to the zone of sharpness that makes the video content look professional and attractive. The visio pro set also includes lens care kit - 3 original double layer microfiber Protective Transportation Pouches - one for each lens, 1 Original lens cleaning Microfiber Cloth with pouch and spring hook and 1 lens cleaning foldable brush for safely keeping and carrying all the lenses. DREAMGRIP VISIO PRO Ultra Low Distortion Lens Set for Any Smartphone Phone Lens Attachment - The best and steady shots with dreamgrip evolution rigs For the best steady and safe and convenient hold it's recommended to use Evolution Rig to connect and align a lens to your smartphone. Macro 10x lens macro lens set has the magnification ratio 10 and shows the things 10 times bigger from their original size. Ready to use with any smartphone - standard set features the clip to mount the lens directly to any smartphone camera for taking pictures; You just need to screw selected lens in and clip it on with aligning center-to-center to the phone camera. You can use the selective focus for video as well. And the same time it is truly universal to accommodate any DSLR, VCR or action camera with standard ¼" connecting thread. MXS Overseas Ltd. MB1712-1 - You can use all or several elements to create the custom camera support gear you need for the particular shot. Pan stabilizer and "c-shaped grip" setup - this basic but useful construction helps you to film from the ground level straight and up "worm eye" angle, and film steady shots even if walk with the camera tracking, elevate the camera over the eye level, move camera left or right with just one hand pan, following. Rig on wheels - "roller" setup - this lightweight construction will allow you to move the camera to both sides slowly and steady as well as moving along a circle following chosen axis angles. Dreamgrip still & motion is the universal modular kit to equip every visual content Creator with a complete set of extensions to support in filming cinematic quality moving shots and creative camera angles. DREAMGRIP Still & Motion Camera Support Kit | Universal Modular kit with Handheld Stabilizer and Tabletop Mobile Rolling Slider Dolly - Smart - enhanced lightweight universal tripod has the smart and original ¼" track connector to tighten the Rig securely and firmly to the Tripod. To elevate the camera higher you can use the remote control connected handle side to the Dolly with the standard connection bolt of 1/4". Dolly with evolution rig - "skater" setup - by adjusting the wheel axis angle may control the moving radius to capture a still object from around, and the control over the tilt almost 180 degree wide that delivers you both low-angle "worm eye" for bigger objects, and high-angle view over smaller objects.
. And the same time it is truly universal to accommodate any DSLR, VCR or action camera with standard ¼" connecting thread. Quick release plate - for swapping cameras on the fly and allows you to pan a full 360° and 90° to get the perfect angle for shooting. SeaMeng - Why do you choose our Kids Walkie Talkies? 1. Connect the telescopic remote control to any free bolt on the Rig to regulate the moving speed. All you need to build a custom gear: the kit features handheld pan stabilizer, 4 wheels Dolly, manual telescopic remote control, a number of smart connectors, universal smartphone Clamp holder, and 3D bubble level for easy visual control over the actual camera position. Package included 2* kids walkie talkies 1* user manual Smart - enhanced lightweight universal tripod has the smart and original ¼" track connector to tighten the Rig securely and firmly to the Tripod. The visio pro set also includes lens care kit - 3 original double layer microfiber Protective Transportation Pouches - one for each lens, 1 Original lens cleaning Microfiber Cloth with pouch and spring hook and 1 lens cleaning foldable brush for safely keeping and carrying all the lenses. You can use all or several elements to create the custom camera support gear you need for the particular shot. Pan stabilizer and "c-shaped grip" setup - this basic but useful construction helps you to film from the ground level straight and up "worm eye" angle, and film steady shots even if walk with the camera tracking, move camera left or right with just one hand pan, elevate the camera over the eye level, following. Rig on wheels - "roller" setup - this lightweight construction will allow you to move the camera to both sides slowly and steady as well as moving along a circle following chosen axis angles. The cool camouflage walkie talkies support 22 main channels 462-467mhz FRS/GMRS with Sub-channels, can provide one-to-one and one-to-more communication for kids 2. Kids Walkie Talkies with Backlit LCD Display 22 Channels 2 Way Radio Toys with Bulit-in Flashlight Long Range Walkie Talkies for Indoor Outdoor Activities, Adventure, Camping, Hiking camo pink&blue - Ubacklit lcd display: the handheld walkie talkie is design with LCD backlit display, and the bulit-in flashlight also can be used as night light, make it more convenient to use at night, ideal for indoor and outdoor. U children friendly design: design with vox hands free and keypad lock function, and the compact talkie toy comes with belt clip, it is easy for kids to push to talk, make it convenient to carry anywhere. HomeFocus Wall Sconces,USB LED Bedside Reading Wall Lamp Light,Living Room Wall Lamp Light,Corridor Wall Lamp,LED 4.2-5Watt 3000K,USB Charging Port,Hardwire Installation,Metal,Satin Nickel. MXS Overseas Ltd. DG-OTN-01 - Approaching and moving away from an object in frame will be smooth and easy to shoot. Usafety and eco-friendly: the walkie talikes are made of standard toy material, durable and environmental, and the transmission power is only 05w, no radiation to children. U long range transmission: with a generous 3km range in open field, 22 FRS/GMRS channel ensures stable voice communication, your kids can use this two way radios for outdoor adventures, no worry about weak signal. Uclear sound quality: the travel walkie talkie with auto squelch function can mute the background noise, so you are free to use 99 low-frequency tones and receive the clear and smooth sound. All lenses 100% compatible with Evolution Rig, but also can be used with any threaded connector with 17mm size. The visio pro set also includes lens care kit - 3 original double layer microfiber Protective Transportation Pouches - one for each lens, 1 Original lens cleaning Microfiber Cloth with pouch and spring hook and 1 lens cleaning foldable brush for safely keeping and carrying all the lenses. The 3+2 Set DREAMGRIP Original ¼ Track Nut Connector Original Bolt Screw 3 Bolts, 2 Track Connectors in a Pack - Smart - enhanced lightweight universal tripod has the smart and original ¼" track connector to tighten the Rig securely and firmly to the Tripod. No other tripod will deliver the stiffness and immovability unless is using with the Connector. Universal - each tripod is the best with dreamgrip rigs. 2 original 1/4" track nut connector and 3 Standard Bolt Screws in a Pack. The original Bolt if screwed in the Track Connector. Stage 45 - Stabilizer on dolly - "scorpio" setup - enables easy optical zooming effect with any smartphone or camera that appears professional on the screen. The original Bolt if screwed in the Track Connector. Full touch screen sensitivity and compatibility allows for high phone responsiveness. 9h hardness, impact Resistant, Delicate Touch. Precision cut for the speaker, DOES NOT interfere with the camera or sensors. Specifically made for iPhone X. All lenses 100% compatible with Evolution Rig, but also can be used with any threaded connector with 17mm size. Easy to install screen protector allows for complete touchscreen sensitive, you won't even know it's there! Smart - enhanced lightweight universal tripod has the smart and original ¼" track connector to tighten the Rig securely and firmly to the Tripod. The original ¼" track connector is useful for mounting DREAMGRIP rigs on any standard photo/video tripod and to other supports with the standard ¼" thumb screw. Fingerprint free: hydrophoboic and oleophobic screen coating protects against sweat and oil residue. You can use all or several elements to create the custom camera support gear you need for the particular shot. iPhone X/XS Tempered Glass Screen Protector 2 Pack - Pan stabilizer and "c-shaped grip" setup - this basic but useful construction helps you to film from the ground level straight and up "worm eye" angle, move camera left or right with just one hand pan, and film steady shots even if walk with the camera tracking, elevate the camera over the eye level, following. Rig on wheels - "roller" setup - this lightweight construction will allow you to move the camera to both sides slowly and steady as well as moving along a circle following chosen axis angles. All-in-one optics set: visio pro includes 3 lenses 17mm size Wide Angle, Telephoto Portrait, and Macro ready to use with any smartphone. Realbag - Please do not put it next to fire. Dolly with evolution rig - "skater" setup - by adjusting the wheel axis angle may control the moving radius to capture a still object from around, and the control over the tilt almost 180 degree wide that delivers you both low-angle "worm eye" for bigger objects, and high-angle view over smaller objects. The visio pro set also includes lens care kit - 3 original double layer microfiber Protective Transportation Pouches - one for each lens, 1 Original lens cleaning Microfiber Cloth with pouch and spring hook and 1 lens cleaning foldable brush for safely keeping and carrying all the lenses. The original Bolt if screwed in the Track Connector. Durable Colorful Slim Small Laptop USA Fashion Bag - American Flag Backpack - Air bubble free: comes with all accessories needed for a successful installation 2X GLASS Screen Protectors, Wet/Dry Wipes, User Guide, Alignment Frame, and Dust Removal/Guide Stickers. Ultra thin: premium 2-pack 02mm thick tempered glass protector for the most natural viewing experience. Colors could be slightly different upon the angle of light or the kind of monitors. Excellent workmanship - this bag is meticulous with seams as well as complete with nice adjustable cushion pad straps, book bags for women, bookbags for women, bags for men, school backpack for boys, lightweight backpack, womens laptop bag, college backpack for women, computer backpack, mochilas para hombres, school bags for girls, backpack laptop, kids backpack girls, convenient to store stuff, bookbags for boys, vinyl coating for waterproof. Fingerprint free: hydrophoboic and oleophobic screen coating protects against sweat and oil residue. Approaching and moving away from an object in frame will be smooth and easy to shoot. HuiTong 18HT006 - Dolly with evolution rig - "skater" setup - by adjusting the wheel axis angle may control the moving radius to capture a still object from around, and the control over the tilt almost 180 degree wide that delivers you both low-angle "worm eye" for bigger objects, and high-angle view over smaller objects. So this backpack for women, whatever it is called, school backpack, laptop backpack, lasts long enough. Strong zipper - zipper on this cute backpack is strong enough to be used for a long time. All lenses 100% compatible with Evolution Rig, but also can be used with any threaded connector with 17mm size. Specifically made for iPhone X. 2 original 1/4" track nut connector and 3 Standard Bolt Screws in a Pack. A layer of non-skid rubber can make it fixed stable. 360 degree rotating mount, vertical, user can quickly adjust the viewing angle as needed - horizontal, or any other angle.1/4" male thread, you can mount a phone holder，gopro adapter or other photography accessories on it. Flexible Phone Mount Holder, Lazy Phone Stand, Selfie Stick Handheld Monopod with Bluetooth Remote for Mobile Phone Gopro Compact Camera - Blue - All you need to build a custom gear: the kit features handheld pan stabilizer, manual telescopic remote control, universal smartphone Clamp holder, 4 wheels Dolly, a number of smart connectors, and 3D bubble level for easy visual control over the actual camera position. All-in-one optics set: visio pro includes 3 lenses 17mm size Wide Angle, Telephoto Portrait, and Macro ready to use with any smartphone. Many names for it- school bags, bagpack. Phonevideo KIT2 Phonevideo KIT2 - Pending smart - enhanced lightweight universal tripod has the smart and original ¼" track connector to tighten the Rig securely and firmly to the Tripod. Phone holder is suitable for the cell phone from 2. 4 to 3. 3 inches in width. Pocket size, the flexible stick plus phone holder and Gopro adapter is about 13. 9" long and even shorter in case of folding it. Air bubble free: comes with all accessories needed for a successful installation 2X GLASS Screen Protectors, User Guide, Wet/Dry Wipes, Alignment Frame, and Dust Removal/Guide Stickers. Ultra thin: premium 2-pack 02mm thick tempered glass protector for the most natural viewing experience. Whether it is used as laptop bag for women, computer bag, travel backpack for women, book bag, rucksack, school bag, bookbags for girls, travel bags for women, bookbags, laptop backpack for men, school backpack for girls, backpacks for men, book bags, mochilas, computer bags for women, laptop bags, carry on backpack, boys backpack, college backpack, it will do good for you. Movo Smartphone Video Kit V2 with Grip Rig, Wireless Lavalier Microphone, LED Light & Wireless Remote - YouTube Equipment for iPhone 5, 5C, 5S, 6, 6S, 7, 8, X, XS, XS Max, Samsung Galaxy, Note & More - Multiple uses, a cell phone stand for desk, this flexible monopod can be used as Gorpo extension mount, or a steering wheel phone holder, plus a bluetooth remote it becomes a pefect mini selfie stick for recording the wonderful moment. Tool-free, you can twist the flexible stick as what you like, the flexibility brings a lot of conveniences, hang on or wrap around any other rod-shaped or thin object. Connect the telescopic remote control to any free bolt on the Rig to regulate the moving speed. To elevate the camera higher you can use the remote control connected handle side to the Dolly with the standard connection bolt of 1/4". WINaked SmartTech & Innovation - High transparency: hd crystal clear viewing experience, you won't even know is there. 02mm Thickness. You can search for it as bagpacks men, backpack with laptop compartment, backpack for kids, back pack for man, bookbags for men, high school backpack, book bags for boys, slim backpack. High quality product backed by customer service - if you don't absolutely love this, you are free to contact us for return, replacement or refund. Durable and sturdy - this american flag bag is durable and sturdy, travel backpack, girls backpacks, backpack for men, waterproof backpack, backpack for boys, constructed of Polyester, backpack for girls, laptop backpack for women, kids backpack, back pack, backpack for teen girls, bookbag, durable inside lining material is applied to prevent it being torn or defect than cheaper ones. A layer of non-skid rubber can make it fixed stable. 360 degree rotating mount, user can quickly adjust the viewing angle as needed - horizontal, vertical, or any other angle.1/4" male thread, you can mount a phone holder，gopro adapter or other photography accessories on it. Rc101 bluetooth remote: remotely triggers your iPhone or Android Smartphone for Selfies, Sleek Design, Includes Key-Chain Lanyard. WINAKED iPhone X Screen Protector 2 Packs Tempered Glass Screen Protector with Advanced Clarity 3D Touch for Apple iPhone X/XS Easy Install Bubble Free Compatible with Most Case 99% AccurateTouch - Ready to use with any smartphone - standard set features the clip to mount the lens directly to any smartphone camera for taking pictures; You just need to screw selected lens in and clip it on with aligning center-to-center to the phone camera. Ubacklit lcd display: the handheld walkie talkie is design with LCD backlit display, make it more convenient to use at night, and the bulit-in flashlight also can be used as night light, ideal for indoor and outdoor. U children friendly design: design with vox hands free and keypad lock function, it is easy for kids to push to talk, and the compact talkie toy comes with belt clip, make it convenient to carry anywhere.